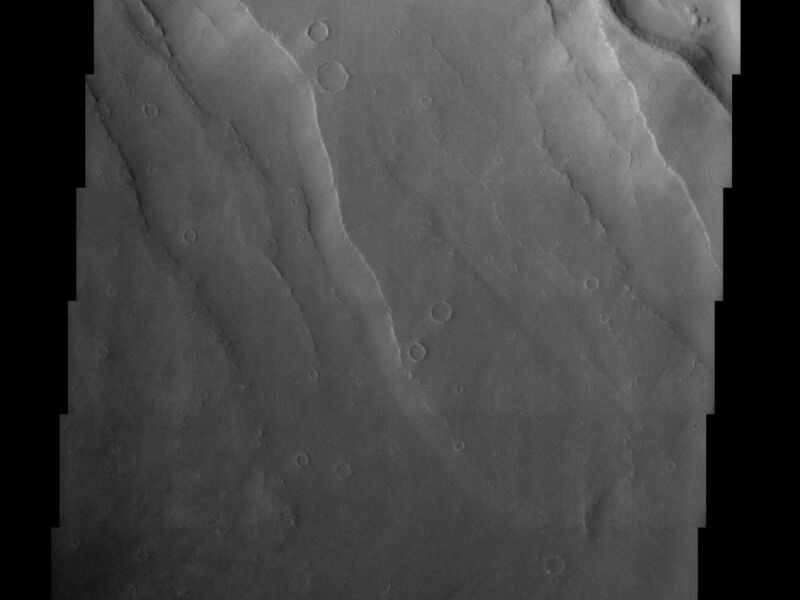 This THEMIS image covers a tract of plateau territory called Ophir Planum. The most obvious features in this scene are the fractures (ranging from 1 to 5 km wide) running from the upper left to lower right. Localized rifting and deep-seated tension fracturing of the crust probably formed these cracks. The wall rock displayed in the upper part of the cliffs appears to be layered. The southwest-facing wall of the largest and uppermost fracture has classic spur and gully topography. This type of topography is created by differing amounts of erosion. Also seen in this image are some scattered impact craters and some dark wind streaks in the lower right. The Ophir Planum plateau separates two separate smaller canyon systems, not visible in this image, (Candor Chasma to the north and Melas Chasma to the south) in the Valles Marineris canyon complex. The whole Valles Marineris canyon system extends some 4,000 km across the equatorial realms of Mars. For comparison, this would stretch from New York City to San Francisco. Plateaus and spurs might make you think of cowboys on the open plain. "Spurs" in this context, however, are simply ridges that can be seen on the side of the southwest-facing wall of the large fracture that splits the terrain. Gullies stretch down this slope as well. Both of these features are caused by erosion, which is a mild force of change compared to whatever tension cracked the crust and ripped apart the land. The wall rock displayed in the upper part of the cliffs appears to be layered, suggesting that different kinds of rocks and minerals can be found in each banded zone. The Ophir Planum plateau separates two separate canyon systems in the Valles Marineris complex, the largest canyon in the solar system. If Valles Marineris were on Earth, it would stretch from New York City all the way to San Francisco. That will give you some idea of the geological forces that have acted upon the planet over time. 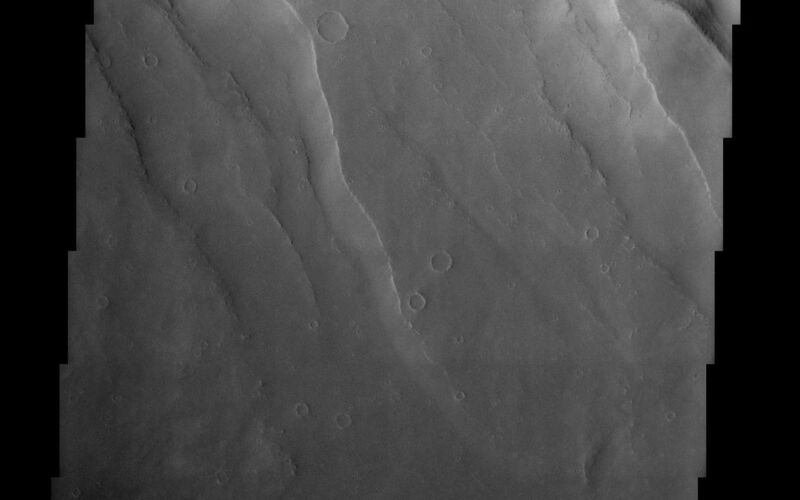 Look for scattered impact craters and some dark wind streaks in the deep dark terrain (lower right) as well.